When you move on to the southern coast of the Mediterranean, you will get into the historically rich Lycia, which is traditionally called the Tekke Peninsula. When you start walking down the trail, you will witness its diversity and enjoy the lovely vistas of the mountains rising sharply from the rocky coast. The mountains also make way for forestry with cedar and juniper at higher elevations along with carob and strawberry trees. The area is crowded for both coastal tourism and its agriculture. The Lycian people were independent and enjoy a high standard of living. They have gone through many wars and were democratic as well. because of a well strategic position of the area, they got some good opportunities for sea trade business and sometimes piracy also. The Persians, Alexander the Great entered the Lycian and people got the influence of the Greek culture. After that, the Roman Empire spread its wings in Lycia and developed many ports and cities and equipped them with temples, forums, ceremonial gates, baths and theaters along with linking with paved roads. The Roman Empire ended during the 4TH C and Christianity was established. Till this date, you can find some Byzantine monasteries in the hills along with numerous ruins and graves. When you stroll the trail, you can pass through twenty-five historical and remote sites. The walking route is stretched across 540 km from Fethiye to Antalya, and it will take 29 days to walk around this Lycia’s coast in Southern Turkey. The trail is unsuitable for mountain bikes and what you will get there includes mule trails, old footpaths with stony and hard underfoot. The gradients often get steep with the proximity to mountains and coast. Kate Clow has way marked, designed and researched the trail in 1999. He is a British-Turkish historian who designed this for protecting and identifying some old roads in Turkey. Both the start and the end points are near the Dalaman airport and the Antalya international airport respectively. The public transport system is good and you can also engage into the activities like paragliding, canoeing and swimming. If you are planning to trek, then visiting the trail in Spring or Autumn (between Feb and May or Sept and Nov) in the best. Sumer gets too hot and not suitable for walking. There are small hotels and accommodations available in almost every section (expect three high-level ones) to spend nights. If you are trekking independently, you can access facilities of wild camping with water. 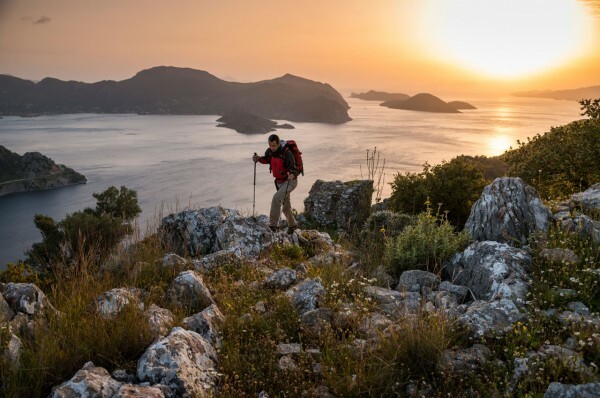 This second part of the coastal Turquoise trails stretches across 820 km from the Mediterranean to Aegean. The Carian civilization discovered the area and you will find numerous historical significance and ancient ruins. You can witness the mule path that connects villages to a mountainous hinterland from the coast. The economy of the region is well supported by the almond grove and olive terraces along with the slopes of pine forest cloak mountain. You will definitely love the color and tradition of the unspoiled area. If you are traveling in a group or independently, you can hike and enjoy the charm and cultural treasures of the region. To get detailed information about the region and the route, you can easily avail a map or a guidebook. There are simply a lot of things to do. Whether just watching the lovely coastline across to the South Aegean’s Greek Island or discover the ancient relics. For fun, you can climb up the forests with the adorable flavor of pine or swim in the crystal clear waters at deserted beaches. You can also witness some rare mountain goats in the Datca peninsula’s remote forests. Overall, Turquoise Trails truly hails magical landscape.